Compelling build quality and spec levels make this a must-try, easy- strumming dread for the money. High quality timbers and construction. Complex tones for a new instrument. Unoriginal design. Schertler pickup doesn't sound very natural. Adding UK-based final assembly and QC to a Chinese build process, Auden is a new UK firm offering a classier take on acoustic manufacturing. Here we take a look at a dreadnought electro-acoustic. Auden's current 'one-retail price' means that your buying decision is taken away from which one you can best afford, and points it at which instrument you best like, including this electro-acoustic. "Exacting attention to detail and superb finishing tell you immediately that both care and craft are high on the Auden agenda"
We have a fairly traditional approach to all-solid wood soundbox construction. Clearly very high-quality timbers, exacting attention to detail and superb finishing tell you immediately that both care and craft are high on the Auden agenda. In fact, Sparkes tells us that there are just 15 workers in the Chinese facility, each using hand tools in a 'bench-made' production process. It shows: extremely tidy scalloped X-bracing, struts and lining; beautifully executed maple and rosewood binding front, back and sides. Against the deep chocolate brown of the solid Indian rosewood, it's very much understated classic-meets-modern precision. Interestingly, Auden does its final assembly - including final neck set, fret finishing, hardware/electronics fitment, buff and polish - here in the UK, along with setups and final QC. A nice touch is that in every guitar case is an invitation to visit Auden's Northamptonshire facility, to meet the team and get your guitar set up as you like it. The solid mahogany neck has a scarfed headstock joint and glued-on heel with a modern, slimmish, rounded profile that will offend nobody. Finished in satin polyurethane, it feels fast to play, the modern vibe continued with a gentle taper in thickness as you go up the neck. The high-spec approach continues to bridge and fingerboard; which is all ebony, as are the bridge pins, simply designed, and expertly executed. If there's a criticism, it's that Auden is making little attempt at originality in design, lest we forget that the most 'non- classic' new acoustic designs of the last 25 years are all but curios in real sales terms. The classics, meanwhile, are still selling. Ahem. Another quality touch is that Auden supplies a custom-shaped bone saddle in addition to the composite saddle that comes factory fitted. The recommendation is you use the composite saddle if you play plugged in a lot (it has more even vibration transference to an under-sadddle pickup), but the bone saddle if your playing is predominantly acoustic (it sounds 'better' acoustically): it's great to have the option. The pickup in question is a Schertler Lydia system; an undersaddle transducer, tiny preamp section with two 3V lithium batteries and a mini volume control tucked neatly in the soundhole. The fretting and setup of this guitar is exceptional from a sales point of view; a great compromise of low action and easy playability without sacrificing too much vibration and tone. Coupled with the easy-feeling neck, it's very easy to get to grips with quickly. If there's a trade-off, it's that a little more fight in the setup and tension in the strings will almost certainly suit more experienced players, and return a stronger tone, too - something the build and materials are more than capable of delivering. "It's a particularly sonorous dread, as clear as you like, and pretty 'developed' and complex- sounding for a new guitar"
The Colton conforms to pretty much 'standard' dreadnought dimensions, so with this level of materials and build quality, the deep bass, sparkly but strong trebles and mids that sit back just a touch will come as no surprise. It's a particularly sonorous dread, as clear as you like, and pretty 'developed' and complex-sounding for a new guitar. It doesn't have that lower-mid throat of a decent Martin D-28, for now sounding slightly more 'modern', and 'refined'. Plugged in, we had a Fishman F1 Analog (in a Martin DCPA4), a K&K Pure Mini under-bridge transducer (Collings CJ35) and Taylor's pre-2014 ES (714ce) on hand for comparison. Regardless of guitar, the Schertler is consistently the most crystalline and 'under-saddle'-sounding system of the four through our reference AER Compact 60 III. It's not a plugged-in sound we'd describe as 'natural' or 'warm', though it will cut well in a live band environment, to pull out an upside. The Schertler Lydia remains a question mark for us. Players will argue 'til the cows come home about what is or isn't a 'natural' electro-acoustic sound, if indeed it even exists. 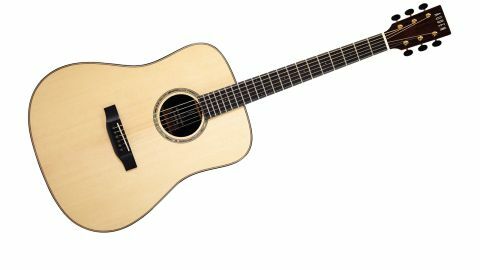 Our opinion is that this one won't appeal to players who dislike under-saddle pickup electro-acoustic sounds; we'd recommend you use your own ears to decide. Otherwise, the Colton is a rewarding, fall-into-it dreadnought that you could happily strum for the rest of your days.